When you only look at cold weather, some of it real, you are surprised the rest of the world isn’t the same, I guess. 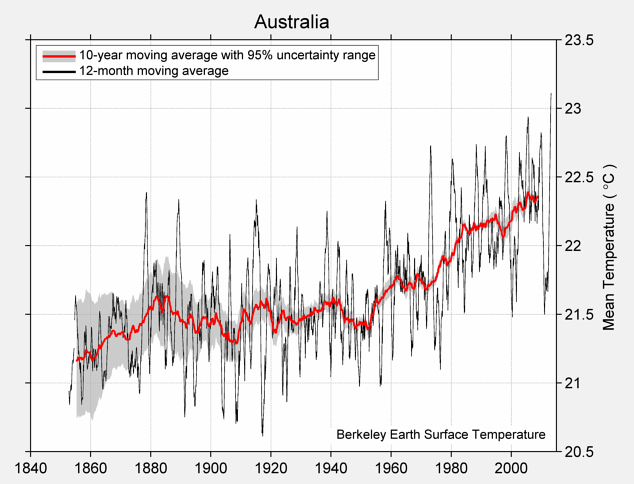 And that is all that huge Ice Age thread on OzPol looks at, never global temperatures! Stupid. Booby acts as if we had 12°C temperature increase since 1850 instead of a 1.2°C increase. IF we were to get a Grand Solar Minimum we would have 0.3°C cooling and even the Little Ice Age the morons keep talking about was only like 0.5°C cooler than early 1900s temperatures—even half a degree cooling would still leave us 0.7°C warmer than mid 19th century temperatures. The other thing the morons do, guided by the confidence tricksters like Dubyne, is obsess over fluctuations between one year and the next. Weather is a noisy record and trends over 30 years are what you look at. The above graph show temperatures are holding up well, considering part of last year and early this year had weak La Nina conditions. this is northern hemisphere data, isn't it? Global. Northern Hemisphere has a lot more land than the Southern. Look at the graph and you can see that the winters really are getting milder while the summers only slowly get hotter. If you look at the graph you see what I mean about the weather record being a noisy one, you see that while the overall heating trend is abundantly clear you can see that individual years might be above or below the belt of temperatures for a decade. Booby is exulting that there is a bit more Arctic ice this year than last year—that is meaningless. 2016 was a big El Nino, last year we had a weak La Nina, this slightly blurs the overall warming trend. The next El Nino will see another big drop in Arctic ice. Fluctuations around a clear trend of decreasing Arctic ice. WMO has declared last month the fifth warmest September on record. The dmi temp has basically returned to normal: it gives real push to the notion that you can't look at these things from year to year as some of the anomaly graphs show really bad looking scenarios but the reality is, at least from year to year, not so dynamic. So longer term is the better observation.... within reason of course. It is science afterall and rationale is required for interpretation otherwise you have nothing being measured somehow(meaning, some curious technology invented for apparently no purpose, by definition, lol....!?!) for no purpose at all... talk about science fiction lol! The Arctic is warming: summer temps hover around 0–2°C or so because the heat is absorbed by melting the ice in Arctic summers. When summer ice is essentially gone the heat will warm the Arctic Ocean substantially! That will affect weather all around the Arctic: Russia, Alaska, Canada–CONUS, Arctic Norway/Sweden etc. Once the final official global annual surface temperature is published, 2018 will be the hottest La Niña year on record, by a wide margin. It will be the fourth-hottest year overall, and the fourth consecutive year more than 1°C (1.8°F) hotter than temperatures in the late-1800s, when reliable measurements began. 2009 will be bumped to second-hottest La Niña year on record, at 0.87°C (1.6°F) warmer than the late-1800s, but about 0.16°C (0.29°F) cooler than 2018. . . . The overall global surface warming trend over the past five decades is 0.18°C (0.32°F) per decade. The trends among just El Niño (0.19°C or 0.34°F per decade), neutral (0.17°C or 0.31°F per decade), and La Niña years (0.19°C or 0.34°F per decade) during that period are all very similar. Over short time intervals of a few years, if there is an abundance of La Niña events, global surface warming will appear to temporarily slow down because La Niña years are cooler than neutral and El Niño years. That happened between 1999 and 2012, when half of those 14 years were cooled by La Niña events. As a result, there were widespread claims that a global warming “pause” or “hiatus” had begun. Every year now seems to be setting some sort of climate record. 2014 was the hottest year on record despite lacking an El Niño. 2015 quickly smashed that record, only to see it again shattered in 2016. 2017 then beat out 2014 to become the hottest year on record without an El Niño (both were neutral years). And now 2018 has become by far the hottest La Niña year ever recorded. The data are making it increasingly hard to deny the reality and threats of human-caused climate change and the need for serious actions to address it. We have certainly seen plenty of hot weather, El Nino weather, already! Australia sweated through its third-warmest year on record in 2018, as disturbing Bureau of Meteorology (BoM) figures point to a trend of soaring temperatures and diminishing rainfall. Every state and territory recorded above average temperatures last year, eclipsing the sweltering conditions of 2017, our previous third hottest year. The nation’s average temperature in 20-18 was 1.14C above the average for 1961-1990, the BoM said in its annual climate statement. “When we look across all of Australia in 2018, we can see that every single state and territory had above average day and night-time temperatures,” BoM senior climatologist Lynette Bettio said in a statement Thursday. • It was the warmest year on record for ocean heat content, which increased markedly between 2017 and 2018. • It was the fourth warmest year on record for surface temperature. • It was the sixth warmest year in the lower troposphere – the lower part of the atmosphere. • Greenhouse gas concentrations reached record levels for CO2, methane, and nitrous oxide. records began in the late 1970s. It's definitely been too hot for too long. What would you all do to reduce the temps? Good answer, yes, that might well help. Sprintcyclist wrote: What would you all do to reduce the temps? Stop mass immigration and let the overpopulated learn to stop overpopulating and hence starve themselves. What would YOU do to reduce the temps.? How many and how fast? ....are we talking like tony abbott fast or actually not wasting tax payers dollars fast? We need to build one or two nuclear generators. Uranium or thorium doesn’t matter (really not much difference.) That would allow the older coal fired power stations to be retired even before their scheduled shut down dates. Stop land clearing, new coal mines (coal mining on the Liverpool Plains, madness!) Pay famers to reforest land. Bamboo is a much faster growing plant than trees. Tariffs/fines/quotas to keep out goods not carbon-neutral. In actual fact, I think wishing for nuclear is futile, takes decades to build a big one. Rest can be done, RET etc etc to build more renewable energy and an ultra high voltage DC line to link the various RE generators. Glad I be 30 years or so and I will be pushing up the daisies. I have tried to leave a light footprint on our environment, try even now to make people see the folly of going on as if there is no problem. Got a problem with nuclear power instead of coal fired power, DRAH?